[Nürburg] – We already introduced you to the status quo of SimRacing with our last preview. 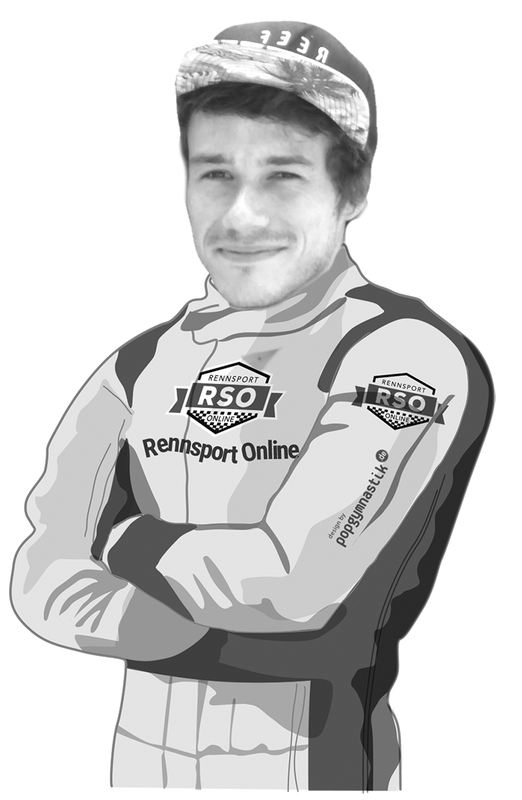 Today, we are very happy to exclusively interview the head of Rennsport Online, keynote speaker and moderator of the raceunion discussion panel on Shaping the Future of SimRacing. 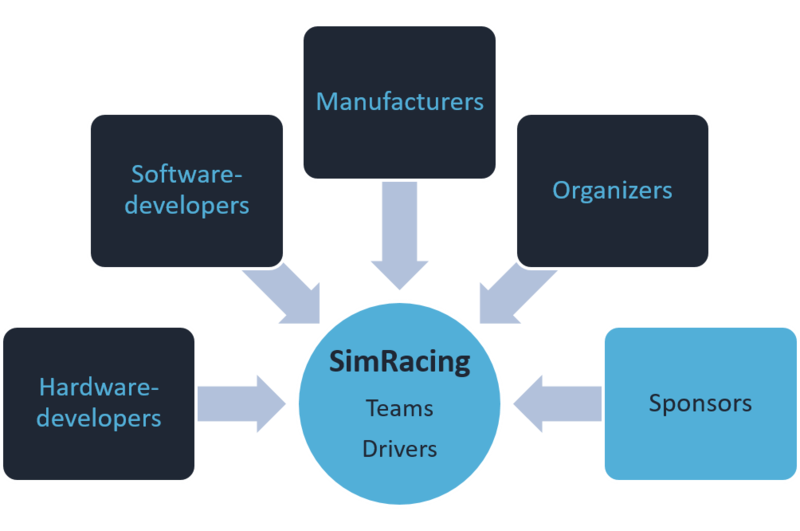 Manuel identifies a vacuum of organizational structures within SimRacing and is missing a central institution which could shape the development of SimRacing. He points on the relatively weak and sensitive organizational structures in SimRacing and adresses potential threats and risks, when external interests force into this weak construct. Right now, SimRacing seems to be easy-influencable, for example through manipulation and competition of event organizers. He is concerned, that the hype about eSports in general is endangering a bottom-up development and identifies the need of supporting teams with their development by intersted or active market players. Only repeated cooperation between two actors will create structures and this colaboration might institutionalize at some point. There is no fast return of investment, hence, investments should target the process of sustainability. SimRacing as an eSport needs to subsidize professional labor force to form organizational institutions and tackle its weaknesses and potential risks for non-related market players. Manuel, the challenges of SimRacings development are well-elaborated by Rennsport Onlines last preview, as are the risks, potential and opportunities. From your experience and perspective as a teammanager, what is it that SimRacing as a whole needs to master this development? First of all, it is a good sign, that we will have the opportunity to discuss these aspects during the discussion panels at the SimExpo. And I think, I speak in the name of most of the teams and drivers, when I express my thanks towards Marc Hennerici and raceunion, to enable all of us by involving us on the mainstage. This shows, that we already mastered the important first step of awareness. To answer the question I would have to predict the future. In my opinion, the best way to predict the future is to shape it. So, if we talk about “shaping the future of SimRacing”, it will be interesting and crucial to learn about the experiences and needs of all the different actors and discuss these together with the interested auditorium. Clearly, a core institution, like the FIA, the ADAC or DMSB are missing in SimRacing to fill the vacuum of lacking communication, cooperation or event organization. Most of the efforts go back to the motivation and work of individuals and have to be coordinated with a real job, families and social life. Hence, “the potential” everybody sees, often is somehow restricted by timerelated contingencies and individual competences. A bottom-up process is hardly possible, due to these circumstances. Meanwhile, organized and well-structured companies push into these structures and have hard times finding partners to help them realizing their ideas, intentions or interests. This is something like the status quo of SimRacing today, I think there is a huge divergence between the high level of competition we have in the sport and the individual opportunities for teams and drivers to help creating organizational structures. To really shape our future, we need collaboration, transparency (at least to a certain extent) and a central institution which can moderate the development. Maybe teams should think and be structured like companies, design workpackages or outline specific tasks and search for suitable labor force. But definitely they need help, again I think this vacuum must be filled. The ISRF can have this role, but from my perspective needs further support, first. Speaking of market players and diverging intentions, how can all these interests be unified for a sustainable future of SimRacing? Let me start with questioning the concept of ‘sustainability’: it seems like everybody is using this posh expression to connect rational and economic intersts with something like a positive intention. The investor says: ‘Look, I help you with your sustainable development’, sounds cool in the first place. But, how do you measure sustainability? When is something like SimRacing sustainable? Sustainability is no state, its a process und it generally has goal-conflicts with homo oeconomicus. When I say, that SimRacing needs sustainable organizational strucutures I am talking of resilience. I am also talking of striving for a shared future where a common goal unifies all actions. When I define SimRacing as the umbrellaterm for all the teams and drivers, competing against each other, then I have the marketing players of hard- & softwaredevelopers, manufacturers and event organizers. Each of them can be differentiated by Simracing-related and -non-related companies. While SimRacing-related hard- and softwaredevelopers generally might have interest to sell their products, connect to the real world and compete against other companies, the non-related ones only have the perspective to access new markets, work their image and in a long term increase their revenues. The same applies to non-related manufacturers. At the same time, they cannot calculate any precise outcome of this investment and therefore have to evaluate whether to take this risk or to sit and wait. However, this behaviour is well known from the theory of diffusion of innovations by Scott (2003), and we definitely can understand an investment in SimRacing as innovation. While this obstacle of decision-making is preventing the growth through more ressources, (event) organizers have hard times to create successful business models and establish themselves on a contested playground. SimRacing Deutschland e.V. is a good example for that: behind this organization which could be a central actor (and yet they are, even if they are struggling), stand only few individuals and their voluntary work, and still they don’t receive the appreciation they should receive, not talking about any appropriate payment for their work here. And as long as this state doesn’t change, we won’t have enough incentives to trigger a bottom-up development from the scene itself. What I think, we need as a sport, is a head-institution like the ones I mentioned which could help coordinating, moderating and supporting the growth of resilient structures; at least resilient enough to help possible investors to channel their investment to the right spots. Huge price moneys like at the Vegas eRace are nothing which can have a long-lasting effect on the development of SimRacing, although they help attracting attention on SimRacing through their sheer number. Who is investing into SimRacing and why? How does it affect Rennsport Online? Let me start with a short anecdote: Do you know Pepsi? Of course you do! Pepsi is a worldwide brand, heavily involved in all kind of sports sponsorship like UEFA’s Champions League, MLS, Cricket World Cup and so on. Do you know Adrenalin Rush or Mountain Dew? Maybe, you don’t. Both are PepsiCo brands with which Pepsi seems to patiently test a future involvement within eSports. Yes, I do not know any details about their marketing strategies and yes, maybe this is part of shaping reputation of their brands or targeting specific ‘young’ target groups. However, it is obvious, that only few ‘big’ worldwide brands take the risks of investing in eSport, although they do so in ‘real’ sports. Lately, we were in discussions with a leading watch manufacturer, who has huge marketing investments in real motorsport, however, their target is not the audience of motorsports in specific, they strive for a relatively secure investment with maximum range (talking of +10 Million viewers/followers here). I am not complaining, because it’s logical and a common marketing strategy nowadays. But, both examples are proof, that eSports, and SimRacing even more, are totally irrelevant within these dimensions. Maybe that is why most of the sponsors, involved in SimRacing, already have a relation to motorsport. They are ‘selling’ the story of their investment; supporting a rising branch, beeing innovative. While many see an obstacle in lacking interest by non-related companies, I think, this is a valuable characteristic of SimRacing, which can be build on. We are one branch, we have to stick together! Companies and actors who are investing in SimRacing today are early-adopters, designing the take-off stage (cf. Rogers 2003, p.11). They find a growing market, with a comparably weak exploitation and therefore can benefit from exclusive and relatively cheap opportunities or comprehensive sponsoring packages. The diffusion-process of successful investments into SimRacing is something where we as SimRacing can actually enter the shaping-process, like discussed ealier. 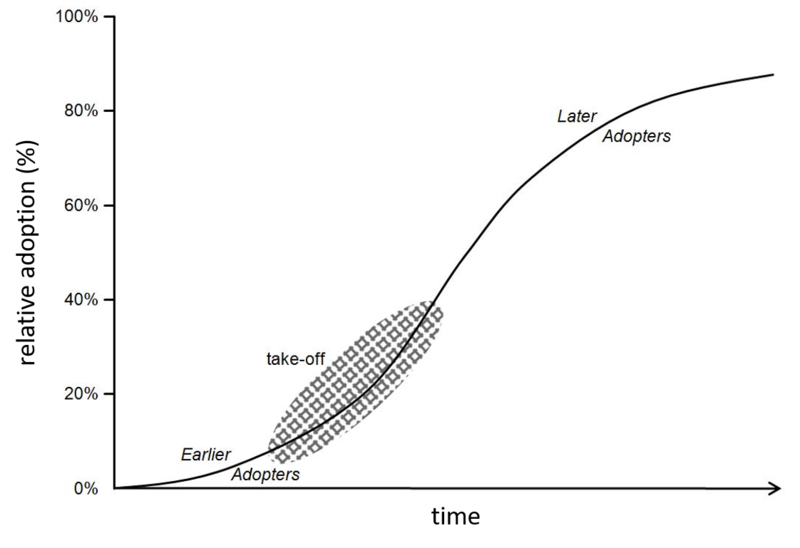 Early adopters: sponsoring SimRacing is still something on the early stage of innovation, however, sponsors benefit from the ability to influence the take-off-process of SimRacing (Rogers 2003: p.11). Within this process of development, investments should aim at building resilient structures by subsidize professional labor force and thus, define and create a strong organizing institution in the center of its all. It will be interesting how the role of ISRF can fill this vacuum in the future or how the role of event organization will change, from for example iRacing organizing high class competitions despite their role as software developers to private organizers like NEO. Beside all the potential SimRacing offers, which risks endanger its development? Did Rennsport Online experience any negative examples for those risks? Investors, potential sponsors or partners should be aware of the weak structures they find right now. It could be important to rather help teams, organizers and developers with their learning and forming process, than metaphorically speaking, make it rain in the club and expect everybody to dance. Let me work with an example here: Ressources are scarce, competition and envy are high, what makes SimRacing a sensitve construct right now. If you have a championship with a price money of 50k, from January to June, and you have another championship starting in April with a double amount of price money, what do you think which of the two championships will have more competitors in May? Racing series are not coordinated; the one with the bigger pocket has better competition, which leads to better races, more viewers, and so on. At the same time, we haven’t discussed the weakness of SimRacing towards manipulation. If, during the same championship, someone from let’s say Asia pays you 50k to not win a race or crash a certain driver out of the race, what do you think happens? Compared to other disciplines, SimRacing is “easy to buy”. In a discussion with ESIC, I learned that illegal bets on eSports become more and more popular in Asia and therefore, endanger competition. And we whitnessed comparable situations in SimRacing recently, and yet I am not starting to talk about doping aspects, like in other disciplines. What I say is, SimRacing is underdeveloped and rather needs help to build structures, than high price money and nonsense-competition between organizers. SimRacing is not LoL, DOTA, CS:GO or Starcraft, we are a niche in eSports and things go different. Speaking of not negative but I would call it difficult situations at my team: This summer we were planning a marketing event with an external company for their business clients. We were supposed to organize simulators, guide their clients through hotlap contests and at least point out crossovers of real and virtual motorsport. However, when it came to costs, organizational details and hospitality, we were left behind with no securities, decisions and communication. We then did not want to bear the full risk and cancelled the event, even though we would have loved to realize it. Lesson learned: we were not apprehended as equal partners but inferior contractors, another challenge for us. Many investors, don’t see the people behind SimRacing: its a diversity of talented humans, not only within their hobby, but in real life, in their profession, with their families. And we will welcome some of them to the discussions during the raceunion panel. Why don’t investors see that aspect, when they start negotiations? Clearly, communication and information are minor developed and we have to start increasing communication to the outside to convey SimRacing to the non-related. You were pointing on the lack of a central organizational institution now several times, can you specify this idea? Different actors will always hold contradictory ideas and aims. 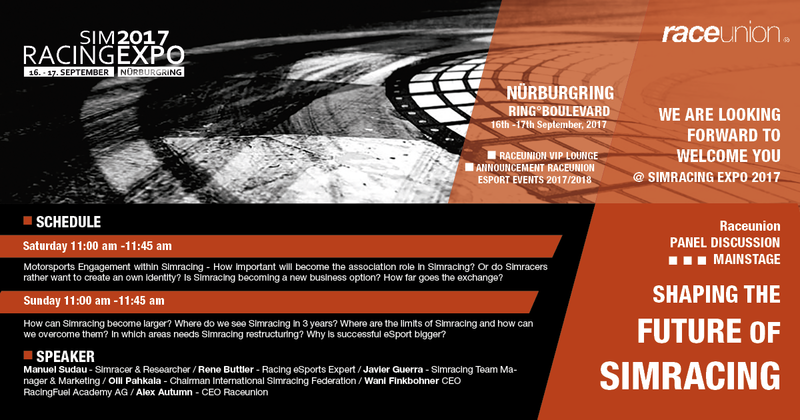 And therefore SimRacing needs to facilitate the exchange of information and start coordinating its actions and events. In the end, a lack of exchange between actors will kill any develpment and the reasons are easy. If we imagine SimRacing as a social network where everybody knows his ‘workspace’ but maybe does not know how it relates to everybody elses. That’s the situation right now. Actors only start communicating if they can clearly identify benefits, like ‘I have something that you want and you have something that I want’. A central institution could help to make it easier, identifying what ‘the others have’ and how this could help everybody. Let me get this straight: I am not dreaming of a romantic fairytale where everbody is friends. We also need competition and therefore there will always be aspects, which you are not communicating about to protect your advantage or ideas. However, SimRacing’s actors are just not connected enough. The denser a network-structure, the faster, easier and hence, efficient communication is. I think, SimRacing needs an institution which can create a densification of SimRacing’s actors, one that is in between of as many actors as possible. It needs a high so called ‘betweeness’, which here discribes how much connected this institution is to all the others. Only then it can ‘controll’ and guide the others and I don’t see such an institution right now, even if there are some actors visible which maybe can fill out this role, like the ISRF. Development is a series of events, and a repeated cooperation of actors will create structures which might institutionalize at some point. Hence, SimRacing has to be aware of and decide which structures it wants to get institutionalized and an institution in between all this could steer this process. Hopefully, the upcoming discussion panel can help to push this idea. I put my hopes in this year’s SimExpo and hopefully, we can show that SimRacing can start a common bottom-up process. Last but not least, Manuel, as well as the whole team of Rennsport Online want to express their deepest thanks to all the involved actors: thank you Marc Hennerici, for enabling this discussion to happen, thanks to Alex Herbst and raceunion for building the framework, thanks to all our invited experts, we will welcome on stage: René Buttler, Wani Finkbohrer, Olli ‘moustache fanboost’ Phakala, Javi Guerra and of course, thank you Philipp Schallenberg, for organizing this event in the background and contributing to this whole topic in an extraordinary, motivated and qualitative way! Gentlemen, please start your discussions! Rogers, E.M. (2003): Diffusion of Innovations. 5th Edition. Free Press, New York.